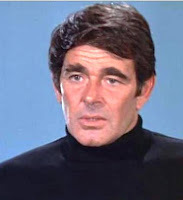 Stuart Whitman as Admiral Matthews. Shortly before The Poseidon Adventure revived his big screen career, producer Irwin Allen made this 1971 made-for-TV film about an underwater city called Pacifica. Set in 2053, it opens with the U.S. President (Richard Basehart) ordering former admiral Michael Matthews (Stuart Whitman) back to the submerged city to oversee the transport of the nation's gold from Fort Knox to Pacifica. Matthews' return is met with open hostility. Everyone blames him for the death of his friend Bill Holmes, especially Bill's bitter widow Lia (Rosemary Forsyth). There's little time to cope with such emotions, though, as Matthews learns about a "planetoid" that's heading directly for Pacifica. Unknown to Matthews, his brother Brett (Robert Wagner) has been plotting to steal the nation's gold bullion as well as its supply of H-128, a valuable, radioactive source of highly-efficient energy. Brett sees the impending planetoid disaster as a perfect opportunity to adjust and implement his scheme. The Flying Sub from Voyage. Intended as the pilot for a new TV series, City Beneath the Sea borrows liberally from other Irwin Allen projects. 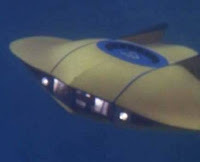 The aircraft that Whitman and Robert Colbert use in the opening scenes is the Flying Sub from Voyage to the Bottom of the Sea. Much of the equipment was recycled from Voyage and Lost in Space. Star Colbert was a regular on Allen's Time Tunnel TV series, as was supporting actor Whit Bissell and "special guest star" James Darren. In addition in Basehart, look quickly and you'll spot Bob Dowdell, who played Lieutenant Commander Chip Morton on Voyage. 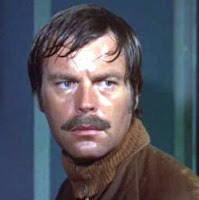 Robert Wagner as the bad brother. I'm not sure if City Beneath the Sea could have sustained itself as a weekly series, but the telefilm moves crisply and features plenty of action. Though Star Trek veteran John Meredyth Lucas wrote the screenplay, there's not a lot of depth to the characters. The most promising is Aguila (Burr DeBenning), a scientist with both gills and lungs. DeBenning later appeared as an underwater-breathing man again--though this time a villain--in Man From Atlantis. 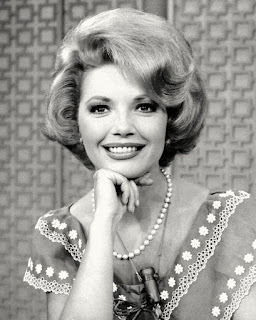 Four-time Oscar winner L.B. Abbott supervised the spotty special effects. His work was no doubt hampered by the modest budget, but still good enough to earn the film a theatrical release in Great Britain. City Beneath the Sea was Irwin Allen's second attempt to launch a TV series about an underwater city. He made a ten-minute clip in 1967 starring Glenn Corbett, Francine York, Lloyd Bochner, and a young James Brolin as Wild Bill Tyler. You can watch it on YouTube. Here's a clip from City Beneath the Sea. 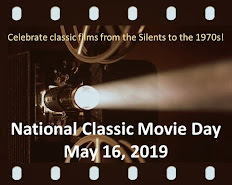 You can view it full-screen on the Classic Film & TV Cafe's YouTube Channel. You can also stream the entire movie at warnerarchive.com. Thanks for posting an article about this movie. At the time it aired it gave me an opportunity to see clips of the flying sub which I had only seen photos of before since Voyage to the Bottom of the Sea was not aired in syndication in my area at the time. Moderately enjoyed the movie, especially Burr DeBenning as Aguila. I thought he was more convincing than the later Man From Atlantis, Patrick Duffy. Didn't know that DeBenning appeared on that show in a similar role. Also didn't know about the 1967 attempt to launch a series. This is a shallow comment, but I really like the colours in the clip you posted. So many sci-fi films/series are dull and depressing, but here the colours are almost refreshing – hopeful, even. It's nice to see that in a genre that's become so dark and full of images of destruction. Thanks for reviewing this film. It's one of the first childhood memories I have of waiting for a television program with baited breath. The two years since the demise of "Voyage To The Bottom Of The Sea" seemed like an eternity at the time so I was primed big time for this one. While Warner Brothers didn't have the talent or facilities to do the movie justice (the miniatures and effects overall are especially wanting) it's still an enjoyable outing. 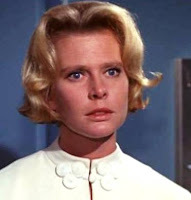 Burr DeBenning was especially good as the Spockian Aguila and it was nice to see so many cameos from the Allen actor pool, particularly Richard Basehart. The movie already felt like an anachronism just a few years after the sci-fi/fantasy heyday of the mid-sixties and I concur that a subsequent series would have inevitably failed. The 1967 mini-pilot is a real curio. I can't help but wonder why Allen didn't do a two-part "Voyage" back door pilot instead. It would have worked beautifully and looked so much better than the paltry stand alone effort. He could have sprinkled Pacifica episodes throughout the last two seasons, amortizing the extra production cost easily and paving the way for a spin off perfectly. Sadly, while many of Allen's sixties pilots look spectacular he never was particularly savy about getting the most bang for his buck once the shows were up and running. Lawrence Montaigne, who was memorable as both a Vulcan and a Romulan on "Star Trek", made a solid early incarnation of Aguila (named Dr. Aguila here in an even more conspicuous attempt to mimic Mr. Spock). It's worth noting how his goatee predates the much later bearded makeover of Aquaman.